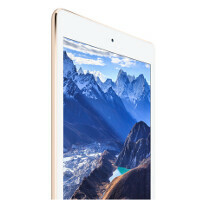 Apple iPad Pro to be unveiled Wednesday, but might not ship until late November? The long awaited (not to mention long-rumored) Apple iPad Pro is said to be finally seeing the light of day on Wednesday. According to 9to5 Mac, which cited those familiar with, or have actually used the tablet, Apple will offer the slate with both 64GB and 128GB of storage. The 12.9-inch screen is 33% larger than the screen on the Apple iPad Air 2. As we mentioned last week, the iPad Pro will run iOS 9.1, which is slightly tweaked for the large tablet. The split screen mode will allow two full-sized iPad apps to sit side-by-side in portrait orientation, unlike the split screen for the iPad Air 2 and upcoming Apple iPad mini 4. Those two squeeze two portrait oriented apps side-by-side in landscape. The iPad Pro will be powered by the Apple A9X chipset, and will be available in Gold, Silver, and Space Gray. Four speakers will be pushing out audio, one of the earliest rumors that we heard about the tablet. There will be a Force Touch stylus and a QWERTY keyboard, and we're sad to say that both are optional accessories. One version of the keyboard is also a protective case for the iPad Pro. Production of the Apple iPad Pro is behind schedule, so according to the report, Apple's game plan is to introduce the tablet on Wednesday, take pre-orders in October, and ship them late in November. While that will allow Apple to have the tablet available for the holiday season, this is not the kind of iPad that is bound to be found quite often under the ol' Christmas tree or unwrapped during Chanukah. The intention was to build a tablet for the enterprise and educational markets. But that doesn't mean that some won't find a huge iPad appealing for personal use. Who realy wants a Ipad Fat? A very fat sheep. If it doesn't run a modified touch friendly MAC OS then I see no use of a larger pro version of iPad. For who it will be? Designers? No designer will work with ipad that runs skimmed down version of photoshop that exists now, Not to mention tons of other designing apps that don't exist on iOS at all. Ye its nice and fun to draw something cool on ipad but working professionally with it will be impossible for a designer if it runs iOS. Who else would want a even bigger ipad? Besides sales man like in car sales etc I see no one else caring for it. Man this even is gonna be killer. Let's see what comes out. I don't see a point in an 18.4 galaxy tab nor a 12.9 inch iPad. I'll take you up on that offer. Where should I be going to take it? Don't worry. The Apple watch, while still selling, is not selling as much as Apple thought it would, neither will this. The Watch market wasn't big for starters. Apple is already the second largest in that market even though they say "we didn't ripoff enough people as initially intended"...that's doing more than good enough IMO. iPad Pro = FAIL! It will cost around 1000 euro's, for that price and even cheaper you can buy and Surface Pro 3! Even a Surface Pro 4 soon! The IPad pro will be a failure, it can only compete with other IPads and Android tablets. It simply cannot compete with a Surface tablet running full Windows on an Intel processor.